It is copyright © Emma Bolden and Jacket magazine 2010. See our [»»] Copyright notice. Is it a rabbit, or is it a duck, or is it both? Since its publication in 1953, readers of Ludwig Wittgenstein’s Philosophical Investigations have faced this surprisingly difficult question in the text’s discussion of the Gestalt Shift. 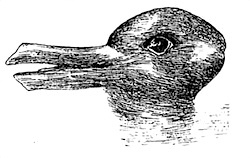 Wittgenstein illustrates, defines, and explains this phenomenon by providing this readers with a drawing which, when looked at one way, appears to be a duck; when looked at another way, the drawing appears to be a rabbit. Therefore, the viewer’s perception of the drawing changes without any change in the drawing itself, and the drawing becomes two things at once. 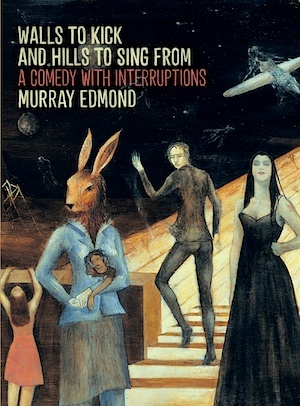 In Walls to Kick and Hills to Sing from: A Comedy with Interruptions, Murray Edmond achieves this same kind of shift, forcing the reader to perceive the poems through two very different lenses at once. The collection is a masterful execution of form which breathes new life into formal poetry and, at the same time, such a complete subversion of form that it proves such structures obsolete. This Gestalt Shift exists in the very structure of the book itself almost as clearly as in Wittgenstein’s duck-rabbit. Edmond names the six sections of the collection after six points of Freytag’s pyramid, perhaps the most traditional and conventional narrative structure. While this suggests a linear book-length narrative, the poems in actuality buck the increasingly dominant present-day trend of the book-length narrative sequence, in which individual poems act as pieces of a larger project and cannot complete their act as individual pieces, unable to stand independently. Instead, the poems fight against narrative and linearity, developing a series of themes and thoughts rather than a narrative. In this poem, Edmond calls to mind the basis of the very word “tragedy” in the Greek tragodia, meaning “goat song;” the reader, therefore, expects the goat’s presence to be synonymous with tragedy. Instead, the goat is completely divorced from the tragedy which occurs within the theatre, knowing nothing about it and instead waiting in hopeful stupidity. As Wittgenstein’s duck-rabbit contains multiple meanings, so does Edmond’s goat, a figure that stands chained to tragedy as the source of the term’s original meeting, but also as a figure completely separated from its original meaning, waiting for another meaning, another purpose. And just as Wittgenstein uses his duck-rabbit drawing to exemplify and explain the idea of the Gestalt Shift, so does Edmond’s goat represent the difficulty with form and structure, especially in terms of language systems: language remains chained to meaning, but, at the same time, is essentially devoid of meaning, much as Charles Sanders Peirce theorized that words work as signs, chained to but nonetheless completely separated from meaning. By drawing the audience’s attention to this enigma, Edmond leads the reader to question the capabilities and assumed sureties of form and language in a manner which parallels and extends the Modernists’ questioning of the efficacy of language. In particular, Edmond’s work follows — though it soon departs from — Gertrude Stein’s theories about language and poetry. Like Stein, Edmond’s poetry suggests that language is incompetent in — if not incapable of — actually conveying anything, especially a person’s internal experience. Edmond finds that the fault lies in language itself — not even poetic language is sufficient, as language as a system is inherently flawed, much as Stein theorized. However, whereas Stein called for the destruction of language, grammar, and convention in works such as “Poetry and Grammar,” Edmond chooses instead to work within the standard structure of language itself as well as conventional formal containers for arranging language, subverting and inverting these systems, rather than destroying them, in order to expose the flaws inherent in them. Edmond, like Stein, moves the power from the writer to the reader; unlike Stein, he does not make radical moves in order to obtain power again. In “Poetry and Grammar,” Stein laments that conventional language, particularly “correct” grammar and punctuation, keeps readers from deeply engaging with a work and therefore fully understanding, as well as taking responsibility for, what they read. Edmond also hints at this idea, but the reader’s power, in his collection, is not a dangerous and dividing power but is, instead, what can unify us as human beings. In order to explore this idea, Edmond makes use of analogue forms to look beyond the small scale of letters and punctuation points to the molds we use to hold language themselves. In “Album of the hour,” Edmond uses the form of a music review to show how “the singing is always its own subject” — in other words, every act of language is about the act of language itself. This, for Edmond, is especially true of artistic acts of language, “performative speech acts” which declare themselves as artifact by their mere existence: “from the first sound the song says I am song and means you will now read me as song;” therefore, it is the manner of singing, and not what is sung, which is important. Here, Edmond implies that real representation may be possible, but not communication, and not through art — though, again, the reader is at the same time aware that Edmond communicates these ideas through a carefully-crafted piece of art in a conventional form. For the Modernists, such paradoxes led only to alienation, to an existence in which we all wander, helplessly and hopelessly apart from one another, unable to communicate or relate to each other. For Edmond, however, there is hope, and that hope lies in the very shifts and slides of language which also frustrate and paralyze the speaker. In poems such as “The animals of the bed,” Edmond twists conventions of language and form in order to jolt the reader out of complaisance. In a theatrical script, two characters speak in their bedroom, continuing their calm conversation as “Two turtles descend on strings and nestle in the pillows,” a subversion of expectations in which the reader experiences both the everyday and the otherworldly in one. The slightest shift of perception can turn the expected into the artificial. Here, Edmond extends the paradox which before related to acts of language and to art to the very concept of normalcy itself: life itself is a staged artifice, though we may pretend it isn’t. Every human act is an act of performance, part of the ritual we perform every day to bury and ignore the fact that the slightest shift in perception can prove the world is far from the normal. Edmond’s use of theatrical structure is therefore not merely an extension but a revelation of the text’s ideas, and the “Revelation” section continues to explore the great power perception has to shape reality. “Folk song” presents everyday objects, from barber chairs to shrouds to chewing gum, in the same light as stage props. Props, like Hedda Gabler’s infamous gun, are carefully chosen for their meaning and appear on stage only if significant to the play’s “reality.” In “Folk song,” everyday objects exist and appear for the same reasons: things exist because we have chosen to make them exist, and things only exist for us through perception and interpretation. Edmond’s revelation opens to show that this phenomenon occurs not only with objects but with time and action as well. Once perceived, an object, event, or moment exists as it exists in itself as well as in memory. Edmond writes in “Old Good Friday” of a speaker in motion on one night: “In its echo I exist / as long as it takes for the bike / to pass.” The speaker, the object, and the moment move on — but, at the same time, as he is “heading out along Glengarry ridge, / it’s going nowhere / because it is perceived,” held as memory in the mind as frozen as photograph or film. Memory, in “A name,” “roll[s] / like a pearl lodges on a collar-bone / with light,” preserved and polished and beautified in its stillness much as a pearl inside an oyster. Heaven, then, is a place of rest and relief which can come only in the absence of perception. Freedom, Edmond suggests, is the ability to live outside of perception, and therefore without assigning meaning in a world where meaning shifts and slides by the nanosecond. Heaven blesses us by freeing us from vision and therefore from responsibility and change, and by allowing us to exist in a world where things — including our own selves — don’t look like things, don’t exist in terms of relations and assignations of meaning and therefore do not exist at all — but are things, real and whole and meaningful in and of themselves. 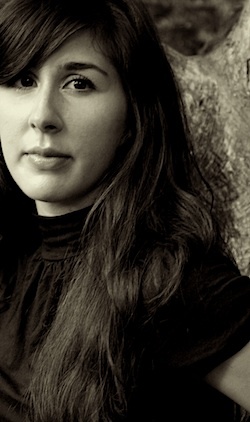 Emma Bolden’s chapbooks include How to Recognize a Lady (part of Edge by Edge, Toadlily Press), The Mariner’s Wife (Finishing Line Press), and The Sad Epistles (Dancing Girl Press). She was a semi-finalist for the Perugia Press Book Prize and a finalist for the Cleveland State University Poetry Center’s First Book Prize and for a Ruth Lily Fellowship. She teaches at Georgetown College and is poetry editor of the Georgetown Review.